My name is William Savage. I am Firefighter/Paramedic in Texas and have been a professional Firefighter for over 13 years. I live in North Texas with my wonderful wife Tanja, several head of cattle and one cat, Montana. I recently rode over 500 miles in 12 hours to Guymon, OK for the annual 5 State Run which covers 300 miles and 5 states in one day. What a trip!! I rode with my best friend, and fellow Firefighter, Derrick Miller( also an Easy Rider) and had a great time. We covered over 1300 miles in one weekend. The day of the ride we started in OK, then through TX, NM and CO, KS and finished in Guymon where we started. 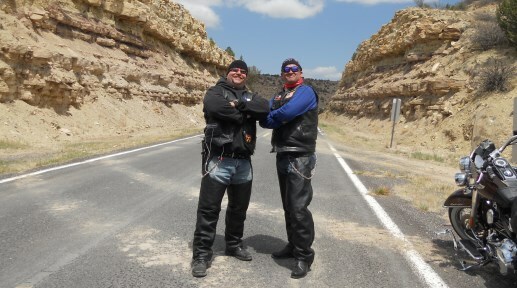 This picture is the two of us taking a break just before we headed into Colorado at Black Mesa. We plan on obtaining our Full Throttle patch very soon. I am blessed to live in Texas with so many roads that cover such vast territory. I look forward to completing all or at least most of the LDR rides in the future. Thank You, and remember- Distracted drivers kill bikers! !